There are molecular sized machines inside our bodies. They look similar in many ways to machines that we design and build ourselves, like dump trucks or even mouse traps. It’s crazy to think that a single cell has the sophistication of a city! The goal of these activities is to illustrate the degree of design and complexity that exists within the human body, or even within a single cell. This is an easy concept to teach to young children. In this post, I’ll provide several suggestions on how you can open your children’s eyes to the fascinating world of molecular machines. Activity #1: Build a replica of a cell ‘city’. We showed our kids this drawing of a city, and told them that the city was going to help us to discover one of God’s fingerprints. We did not tell them that the drawing was a cell city, and since the picture shows similar components as a real city, they didn’t think to ask. We each designed several of the buildings out of Lego, keeping an element of mystery around what the city was going to tell us about God’s fingerprints. If you do this activity, I suggest that you don’t try to build anything too elaborate. Our kids like building with Lego, but it still took a while. We resorted to re-purposing some of our 8-year old’s pre-build Lego buildings to save us time. As we were building the city, we discussed the various functions of the pieces we were building. Once the city was all built, and sufficiently admired, I asked them to guess how the city illustrated one of God’s fingerprints. They were surprised to learn that there was a city just like the one we had built operating inside their bodies. They were even more surprised to learn that the city was so small that they could only see it with a powerful microscope. Also, there isn’t just one of these cell cities, but trillions of them inside their bodies, with new ones being built all the time! Each factory or part of the cell city is a molecular machine, and is made up of other machines – a machine made not of steel or plastic or wood, but of molecules – the material that our bodies are made of. OPTION: If you prefer not to build you own cell city, show your kids this picture and ask the same questions as those above. You could talk about what the various components in the picture are responsible for. For example, the greenhouse grows the raw food material needed for the city, and sends it to the food processing plant that then packages the food and distributes it to the places in the city that need it. Even though the picture only shows the buildings in the cell city, there are molecular machine factory workers, farmers, distributors, etc. that do the work inside each of these buildings. Each of these machines has its own instructions on how to do their work, has recipes to be followed, uses other molecular machines, etc. You may have to clarify that these machines that we are talking about operate inside the cell – we’re only talking about the cell and how it is as complicated as a city. One of our sons thought that the government machine represented our brain. But the brain is made up of millions of cells that have folded into tissues and then into organs of a particular nature, all using machines to assist this process, and all following specific instructions. This can get complicated quickly, so keep things simple. We’re only talking about what is inside the cell, and it’s complicated enough! Have each person build their own machine that can accomplish some sort of specific task. You could build it out of Lego, K’nex, Mechano, Tinkertoys, craft supplies, or something else. Each person could then present his or her machine and tell what it does and how it works. Then ask your kids to compare their machine with the pile of building pieces that they used to make it in as many ways as possible. How long would it take for the pile of building pieces to assemble themselves into a machine like theirs? (They can’t, not ever!) Why not? (Because you need someone smart (someone with intelligence) to build even a simple machine). Next, show your children a picture of miniature machine in the human body (for example, the bacterial flagellum picture at the top of yesterday’s post). Help your children to understand that this tiny molecular machine called a bacterial flagellum is inside their body. It’s so small that they can’t see it unless they use a very powerful microscope. It looks and acts almost exactly like the motor on a motorboat. It is made up of 30 parts and needs all of them to work, kind of like an outboard motor needs all of its parts to work. If one pieces is missing, it does not work at all. Now compare: which is the bacterial flaggelum more similar to, the pile of Mechano pieces (or what ever material you used) or the machine that you built with Mechano? How do you think this bacterial flaggelum machine was built? Unlike the mechano machine we built, the bacterial flagellum needs all of its parts in order to work. It does not work at all if it does not have all of its parts. And it needs someone smart the build it, just like your (child’s) machine needed someone smart to build it. 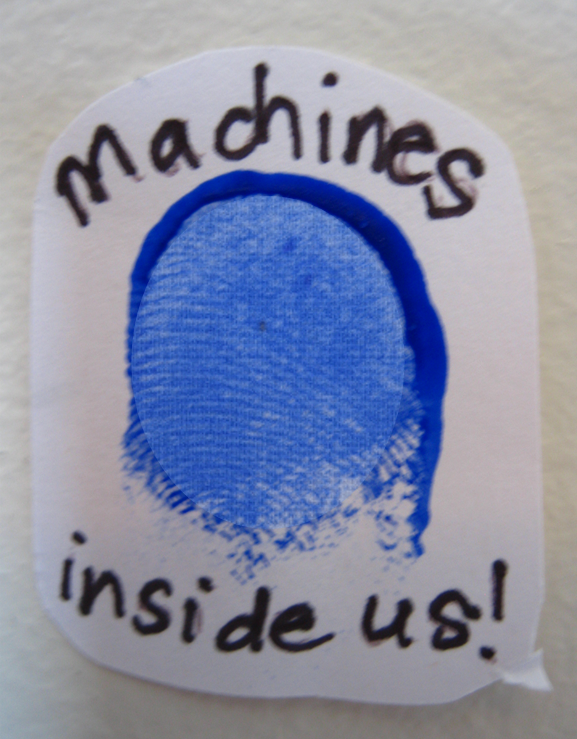 So, who made the machines inside our bodies? God!